The IT Infrastructure Library® (ITIL) is the most widely-accepted approach to IT service management in the world. ITIL is a best practice framework that has been drawn from both the public and private sectors, internationally. It describes how IT resources should be organised to deliver business value, documenting the processes, functions and roles of IT service management (ITSM). This service strategy course enables delegates to learn about the principles and terminology required by ITIL. It helps organisations increase the quality of IT service management by expanding on key elements such as planning, principles, processes and functions. 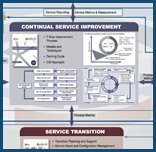 It increases understanding of service strategy with a step-by-step analysis of the main elements of service model: strategy and planning, execution and control and provides the opportunity to sit the ITIL Lifecycle examination in service strategy. The ITIL Intermediate Qualification: Service Strategy Certificate is a free-standing qualification, but is also part of the ITIL Intermediate Lifecycle stream, and one of the modules that leads to the ITIL Expert in IT Service Management. This is an intensive three-day course which includes the ITIL Service Strategy examination which takes place on the final day. This course provides three credits towards the ITIL Expert Qualification in IT Service Management.